I use a lot of crispy shallot both in Chinese and S E Asian cooking. - sprinkling on any Chinese.Thai/Vietnamese noodle soups or Malay noodle soups like laksa or ayam soto etc..
- cooked Chinese green (yaw choi 油菜) like choi sum or pak choi with oyster sauce and sprinkling of fried shallot and fried shallot oil. If you are too lazy and hate deep frying you can get ready fried shallots from most oriental supermarket like this. I never bought this and has always made my own using fresh shallots. In England oriental shallots from the Chinese supermarkets are expensive, it's about £8 - £9 for a kg!! I normally buy English shallots from local supermarkets. The cheapest and best shallots I have found is from Waitrose, it's loose so you can buy as much as you want, it's about £3/kg. To make crispy shallots, first you have to peel and slice the fresh shallots very thin. If the shallot is large, cut into half then slice. Wear goggles if you have to if you are teary. To make the fried shallot very crispy, mix with 1 - 1.5 tbsp of plain flour (per 250g shallot) thorougly at the same time loosen the shallots into rings or half rings. To fry the shallot, use about 3/4 cup of oil per 250g of shallots. Yield: 250g peeled shallots will make about 100g fried shallots. Heat the oil in a wok or large deep frying pan till moderately hot, then add in the shallots, the oil should sizzle. The fresh shallot will lower the temperature of oil very quickly, so turn the heat to medium high so to increase the oil temperature very quickly so the oil will remain hot, sizzling with lots of bubbles. Stir the shallots slowly and continuously to prevent uneven cooking and browning too quickly around the rim of the pan. Once the oil is quite hot, turn the heat down to medium low and continue stirring. To test the oil is at the right temperature, put you hand few inches above the oil, if it feels burning hot, the oil is far too hot. Continue frying till the shallot has become light brown, then you need to watch very closely the shallot will burn very quickly from now. Turn the heat down to very low, continue stirring till the shallot has become golden brown. Heat off and take them out very quickly using a slotted spoon and straight onto a metal sieve to drain with a bowl underneath to catch any excess oil. Let this cool then store in air tight container. The fried shallot will become a bit more browner as it cooled. Storage time: Can leave at room temperature for about a week or few weeks in fridge. The longer you keep, the fried shallot may loose its crispiness. The oil left from frying the shallot is full of flavour, do not throw away. It is excellent to use for any cooking or add some to noodles, dried or with soup replacing sesame oil. I have great affection to fried crispy shallot. Use them a lot in my sandwiches and salads since I do not know how to make them I just grabbed one at the Asian market originating from Thailand. Thanks for sharing your tried and tested recipe as I prefer homemade version since I know what's in there. Great tip! I used to bring bags of this from home! Hi Shayma, Glad to. I have already added your blog on my Reader list 1st time I read it. 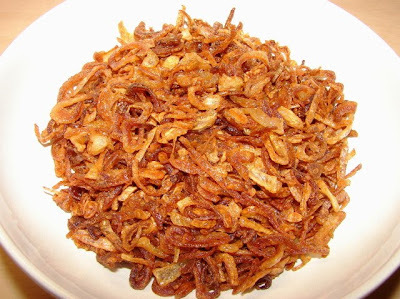 I've always wondered how to make crispy shallots - I've tried deep frying them and they haven't always worked out very well.